Carbs are an important part of our daily diet and are really essential for our body. Carbohydrates provide us with the energy you need and carbs help your body produce glucose. 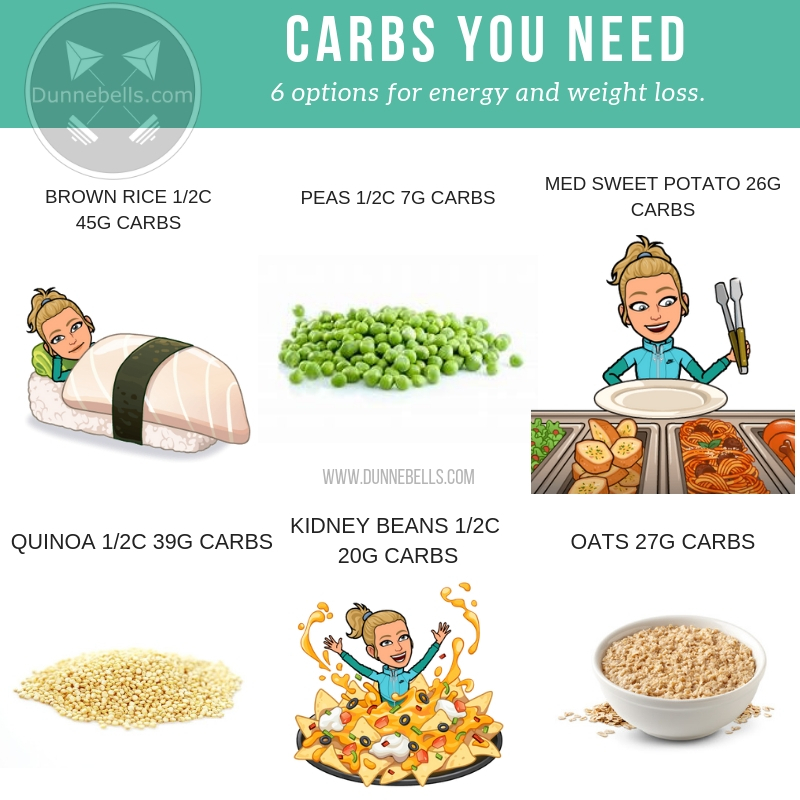 You need energy to efficiently complete your workout, strengthen your body and if one of your goals is weight loss then carbs should become your best friend. CARBS MAKE YOU FAT? NO THEY DON’T! Let’s bust through the myth that “carbohydrates make you fat” right now. If you eat an unnecessarily large quantity of anything, you will gain weight. Not just carbs. Instead of fearing carbs, it is time to shift your mind and look at all of the health benefits that introducing more carbohydrates in your diet can do for you! Side note: While losing over 65 lbs one of the BIGGEST breakthroughs was when I started eating more carbs. I was able to get through my workouts and my body reacted really well to finally receiving what it needed vs. restricting my carb intake for years. DON’T DO IT! Brown rice has balanced manganese content, which is a very healthy mineral. It helps your body to produce energy from carbs and aids in maintaining your energy levels throughout the day. Brown rice can also help reduce your “bad” cholesterol, so what are you waiting for? Time to add 1/2 cup brown rice (42g carbs) into your diet! Green peas are known to be one of the best energy boosters; it is because certain they are rich in carbs. Green peas prevent high blood pressure and make the digestion system of a person better. Green peas are also a rich source of dietary fibers, Vitamin A and iron, which will boost your energy levels at anytime during the day. High fiber foods like green peas also aid in fat loss. If weight loss is one of your goals, you may be interested in these 6 foods to eat for fat loss. Sweet potatoes are rich in carbohydrates. They contain a massive quantity of beta-carotene (vitamin A and vitamin C). They help the body in fighting off fatigue and tiredness. Sweet potatoes make a great pre or post workout snack! Half a cup of Quinoa (about the size of your fist) is similar to brown rice in calories (111) and contains 39 grams of carbs. This makes Quinoa a perfect choice, especially if you are following a macro based diet because of the good amount of healthy carbs in Quinoa. Beans are a great source of complex carbohydrates, fiber and protein! Beans will give you lots of energy and help you to feel full so you can be successful on your weight loss journey. Beans are such a great source of meat free protein for vegetarians or vegans. Kidney beans are so versatile, don’t think about just eating a bowl of beans. Either make a bean burrito, mash them into a burger or sprinkle them on top of a spinach salad, find a way to include beans into your diet in a way that suits your taste buds. Oatmeal acts as a sponge when it comes to your cholesterol and is such a good source of complex carbs for you to enjoy in a variety of different ways! Oatmeal was my best friend when I was trying to lose over 65 lbs and it was because I never just sat down with a bowl of boring oats. Spice them up, use fun toppings like peanut butter, berries, maple syrup and nuts (just to name a few). If you like oatmeal but do want a lower carb option, check out one of my most popular recipes Oatless Oatmeal. A balanced carb diet is a must to help you lose weight and achieve your desired fitness results. To understand YOUR carb requirement better I would recommend contacting an online personal trainer or nutritionist who will provide you with your own custom macronutrients to follow to achieve your results. Carbs give us enough energy to go through the day with energy to tackle life and any sort of extra activites that you want to take part in! Carbs will NOT make you fat. I promise you. If you want to lose weight, develop that toned look and increase your energy following a flexible macro diet and a customized fitness program with the support of an online personal trainer would be the #1 thing I recommend doing. You WILL see results like 100’s of my clients around the world who take part in the 8-week program.